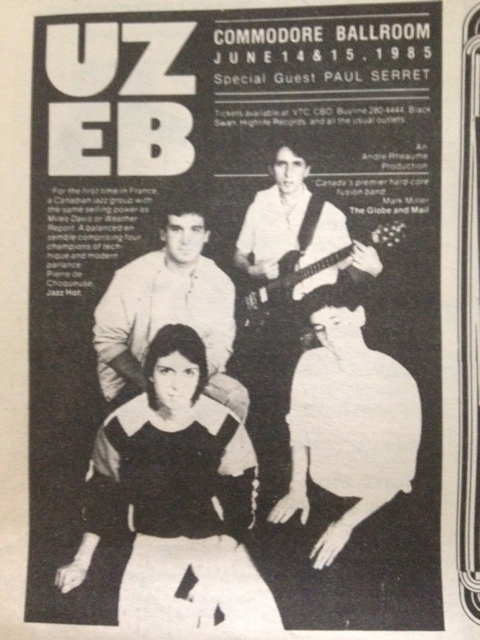 Last year’s Vancouver appearance by Quebec jazz/fusion quartet UZEB was one of my picks for the Top Ten concerts of 1984–right up there with Scorpions and R.E.M. Now the group is returning to the Commodore Ballroom for two nights, next Friday and Saturday (June 14 and 15), performing songs from their first three A&M albums–Live at Bracknell, Fast Emotion and You, Be Easy–as well as compositions from their forthcoming LP. The Straight contacted bassist extraordinaire Alain Caron in Montreal last week, and asked about his musical background, his feeling about rock and roll, and the trials and tribulations of living the jazz life. Have you ever taken any serious music lessons, or did you learn on your own? Oh, I am self-taught. But I took some private lessons with a guy named Art Roberts. This guy is maybe over 50 years old, and he’s really a book. He played it with Charlie Parker, and he knows all the things about bass. So he was my kind of father. After that I went to Berkeley for a semester, but I decided to come back here and play with UZEB. And I think it was a good decision too. Michael Brecker played saxophone on a couple of tracks on your Fast Emotion album. How did you come to work with him? First of all, he’s my favourite tenor player. And the producer of that album knew Michael Brecker personally. We were listening to the song “Smiles and Chuckles”, and we said, “Oh, that’s a good tune for a sax.” Then we looked to each other and everybody said, “Let’s call Michael!” That simple. 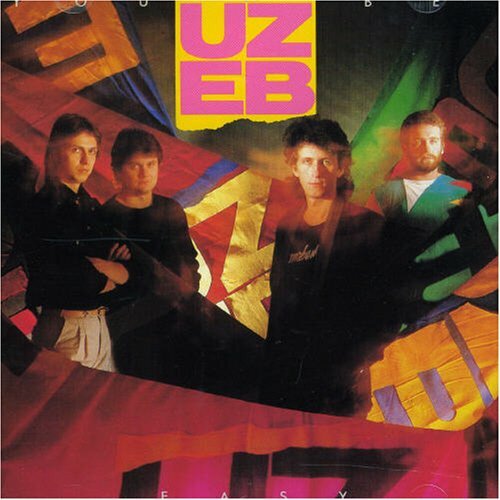 In a write-up from March of last year, Mark Miller of the Toronto Globe and Mail called UZEB “the Van Halen of jazz”. What do you think of that? Do you ever listen to hard rock at all? No. I’ve never really been into rock music. Of course, every time you turn the radio on there is some rock and roll. You go to a club and there is some rock and roll. And I used to play it in the studio a lot. But personally I’ve been more into jazz, bebop, R&B and Latin. That’s where my roots are. What do you think of the Canadian jazz scene? Is there much good jazz coming out of this country? Well I know there are some very very very very good players here in Montreal and Toronto. I don’t know a lot of musicians in Vancouver, except Skywalk. There are good musicians, but the music business for jazz is not real good. 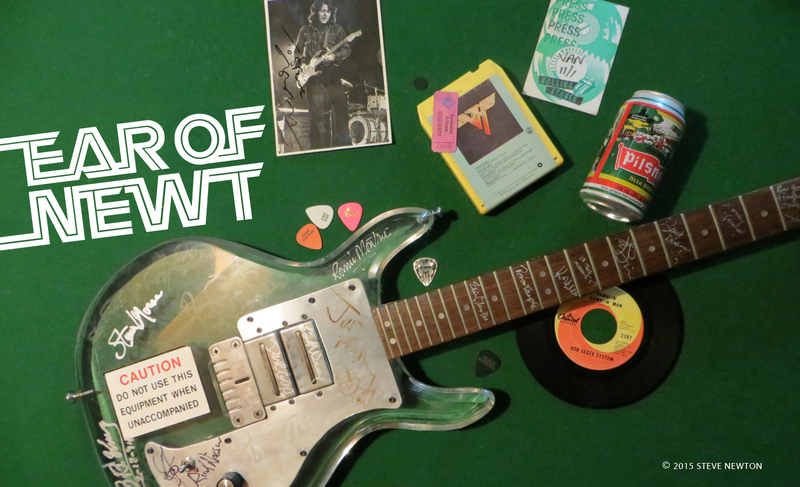 You know, it’s hard to get a record deal, and a place to play. Jazz musicians have always been known for having to struggle to make things meet financially. Does UZEB make enough on their albums and tours to live pretty comfortably? Oh, let’s get it straight! It’s hard. Because we are travelling with really sophisticated gear. We have as many instruments as, let’s say, a rock and roll band–but we don’t make the same amount of money, you know. That’s what makes it a little bit hard. But we’ve been doing this for eight years, and we’re still there, so it’s okay. A lot of people have been making music videos lately, to help sell records. Have UZEB ever thought of that? Oh yeah, we probably will make a video with the next album. But we’ve got to think very specially, ’cause there are no words; there is no obvious story in our tune, you know, it’s all in your imagination. With our music we’re trying to get a mood, so to put it visually is real hard. But we’re thinkin’ about it, and we’ve got some good ideas.